Have you read Solo Training, by Loren Christensen (Turtle Press, 2001)? Not only does he provide lots of training exercises, but he writes in a pleasant, easy to read style. 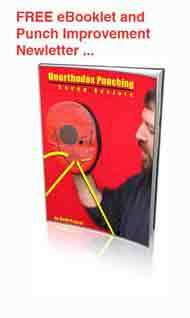 In the book, Loren gives exercises for everything from Whipping Back Fists to Slightly Angled Uppercuts. Before he presents four exercises to try with a Palm-Heel Strike, he has a couple of pages of advice about this particular hit. While you are pondering the above technique, think about adding the Pascal Twist to it. Many issues ago, I wrote about an invisible hand technique. Those of you who own “The New Punch Papers” have the article in your ebook. 1. Practice your palm strike as a follow-up to a kidney punch. You strike with your fist closed. Your opponent will be knocked back from the force of your blow. Immediately continue with a palm strike. No cocking your hand back before the strike. And don’t give me a ‘loss-of-power’ argument. Just hit — make it fast and efficient. 2. Your opponent dodges out of the way of your closed-fisted kidney punch. So, you follow up with a palm strike anyway. It’s immediate — and fast. Lead with the strike, even if you have to take a step to reach your opponent, after he or she avoids the punch. This is the same as the first tip, but the timing changes. In the first tip, the follow up occurs right on top of the first strike. The beat/rhythm is almost together. In this example, your second strike takes longer, because the distance has changed. 3. You back fist at your opponent’s face. Your opponent dodges to the side of your palm. So, open your hand, and palm strike. You’ll be hitting in the opposite direction from the back fist. Why open your hand? To protect your fingers. Try it. You’ll see what I mean.